You can book, change or cancel your range repair appointment at any time online or over the phone. We’ll update you about your range repair appointment via text, email or phone–whichever you prefer. The cause could be a burner clogged up with a spill. If the flow of gas is restricted, the igniter can’t light the gas to produce the flame. A qualified technician can check for loose connections in the igniter electrode and safely clean the burner holes. If your gas range still won’t light after the burner and igniter are both cleaned, it might require replacement of the igniter or the igniter control module. The igniter control module is usually located on the back of the range or below the control panel. Your technician will establish whether the fault is with the coil, the burner socket or the infinite switch. While the coil or burner can be repaired, a broken infinite switch may mean you need to replace your stove. An experienced technician can establish which gas burner has the problem by listening for the click of the igniter when each knob is turned. If a clicking sound is not heard when the burner knob is turned, the cause may be a wire that has become detached between the igniter and the control module. If the wires are attached and the igniter doesn’t spark, the igniter is likely faulty and will need to be replaced. 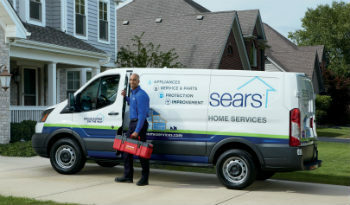 Whether you’re looking for electric cooktop repair or repair of your gas stove, Sears Home Services can help. Our technicians are appliance repair experts who you can trust for repairs on top appliance brands like GE, Kenmore and Samsung. We’ve repaired millions of flat top, countertop and glass top stoves and ranges. Whether your gas burners won’t light or your electric burners aren’t heating, we’ll provide the best local stove and range service technicians in the business. If your problems aren’t with the stove, range or cooktop, contact a Sears technician for oven repair or range hood repair. If your kitchen appliances aren’t needing a repair, but simply a tune-up or inspection, schedule stove, oven and range maintenance with our technicians today. I really like my Kenmore Range.